Dark Souls 3’s E3 Demo Was Kinda Dull. That’s Fine, Right? There’s always a dissonance when one of the most promising new games you see at E3 is also one of the least traditionally “exciting” ones. Last Thursday, I smushed myself into meeting-room theater alongside 30 or 40 other members of the press to watch a demonstration of Dark Souls 3. As someone else played, the game’s co-director, legendary Souls maestro Hidetaka Miyazaki, talked us through the demo. He had a surprising amount of energy, given that he’d been performing this exact demo for two straight days. What did I see? I saw a Souls game. These games never demo all that well—to truly get to the heart of one, you need to go deep, in your own space, on your own time. There is no way to effectively preview the feeling you get when you finally beat a Souls boss at 4AM. The player-character moved faster than main characters in the first two Souls games, making DS3 seem like a slightly faster-moving game in general (though not as fast as Bloodborne). He also had a few new moves, notably the ability to quick-fire a short bow in combat and ready a two-handed sword for a heavy up-thrust that could bypass an enemy’s shield. But at its heart, it was Dark Souls, you know? It wasn’t particularly exciting, because there wasn’t anything revolutionary going on. All the same, given Miyazaki and his team’s track record, Dark Souls 3 will almost surely be, at a minimum, an excellent game. “More of the same” is no bad thing when you’re talking about a series as sturdy and widely loved as Dark Souls. Dark Souls 3 may well wind up feeling like a smidge of a backstep from the aggressive quick-dodging and health-regen in Bloodborne. 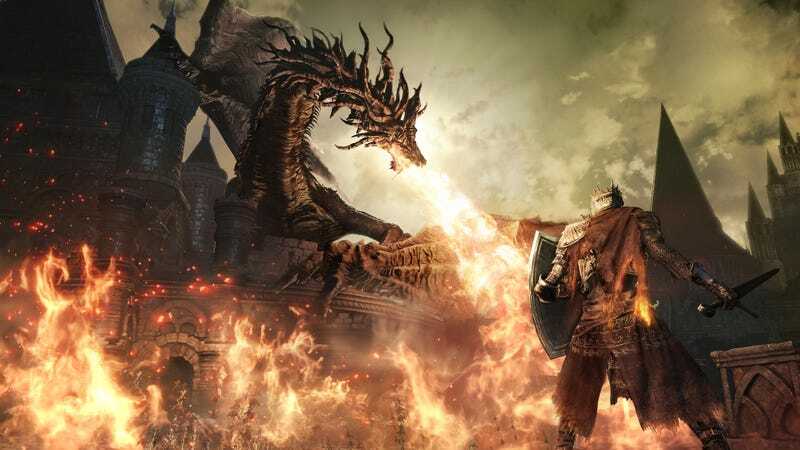 Would it have been nice to see Mr. Miyazaki and his team taking more bold creative steps and, on some level, reimagining what a Souls game can be? Totally. Is it still possible the finished game will be full of the very sorts of surprises that I felt the E3 demo was missing? Of course. Will I play the hell out of Dark Souls 3 either way? Almost certainly.